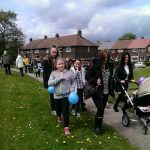 To celebrate hae day 🙂 on 16th May 2015, Ruby wanted to do something to help raise awareness of HAE and we also thought it would be a good idea to raise some funds for HAE UK at the same time. A sponsored walk seemed like a great idea. We (Ruby, her dad and I) spent the run up to HAE Day bombarding Facebook with simple facts about HAE. I also posted photographs of Ruby whilst she was experiencing HAE swells. Most of the photographs were taken as evidence for doctors and not intended for posting on a social networking site. I think that the visual shock of seeing Ruby looking so sick in contrast to her usual happy self was enough to generate great interest. I received numerous private inbox messages and mobile text messages from people offering support and making comments like “I knew that Ruby had an illness but I had no idea how poorly it made her – no-one would ever guess if they saw her happy face”. I received one message from an old school friend who is now a paramedic. She read all the information I gave about HAE and then did some investigations of her own and she made sure that all her colleagues were aware of HAE. I also have many other friends who work in hospitals and many who work in schools who all shown great interest and shared HAE posts to help raise awareness and funds. Sienna, also has HAE and she, along with her mum and one of her sisters also walked with us, as did a wonderful young family from Bolton who read about the event on Facebook. We generated lots of interest en route and collected over £170 whilst walking. We set a target of £200 but that was smashed within the first few days. The total of the donations currently stands at over £1,281.73…. which is a massive 640% of the target initially set. The total continues to rise and we have promises of several more donations. We also received an on-line certificate from ‘Just Giving’, as out of 65,838 fundraisers in the UK, Ruby was in the top 3% of fundraisers during May.